MLR VS MLS, 16th Match, Big Bash League 2018-19. 🏟 Melbourne Cricket Ground, Melbourne. Peter Handscomb is added to national test squad while Jackson Coleman is left out due to personal reasons.Stars have added Jonathan Merlo and Seb Gotch,Melbourne Renegades have named Andrew Fekete and Jon Holand into their 13-man squad.Jake Fraser-McGurk and Tim Ludeman have been axed from Renegades. M Harvey, Sam Harper (wk), Cameron White, Tom Cooper (c), Beau Webster, Mohammad Nabi, Dan Christian, Jack Wildermuth, Jon Holland/Cameron Boyce, Kane Richardson, Usman Khan Shinwari. 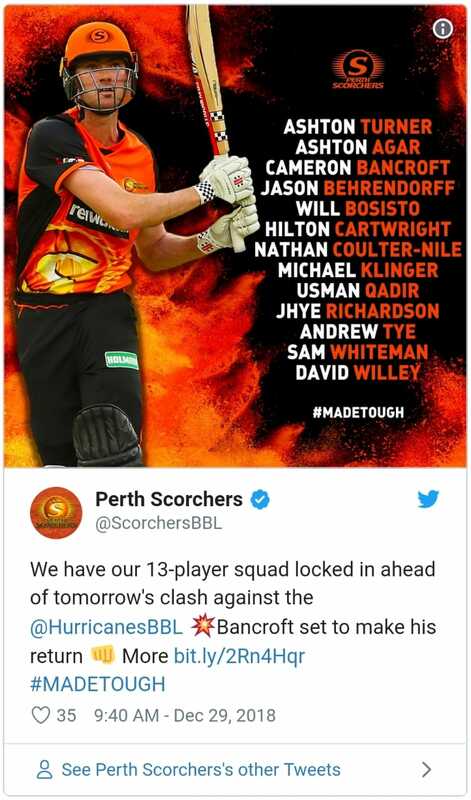 Ben Dunk (wk), Seb Gotch, Nick Larkin, Glenn Maxwell (c), Marcus Stoinis, Dwayne Bravo, Evan Gulbis/Jonathan Merlo, Adam Zampa, Scott Boland/J Merlo, Sandeep Lamichhane, Jackson Bird. SDS VS BRH, 15th Match, Big Bash League 2018-19. They have declared 13 player squad for the match. Greg West is back in the squad replacing Spinner Lloyd Pope. They have also announced 13-men squad for the match. James Pattinson and Alex Ross are added to the squad replacing M Kuhnemann and Mark Steketee. Jack Edwards, Joe Denly, Moises Henriques (c), Dan Hughes, Jordan Silk, Josh Philippe (wk), Tom Curran, Steve O’Keefe, Sean Abbott, Ben Dwarshuis, Ben Manenti. Chris Lynn (c), Max Bryant, Brendon McCullum, Joe Burns, Sam Heazlett/Alex Ross, James Peirson (wk), Ben Cutting, James Pattinson, Mitchell Swepson, Josh Lalor/B Doggett, Mujeeb Ur Rahman. Select B. MacCullam or Joe Denly as per your choice. Best of Luck 🤞. 🏟 Where: Eden Park Outer Oval, Auckland. 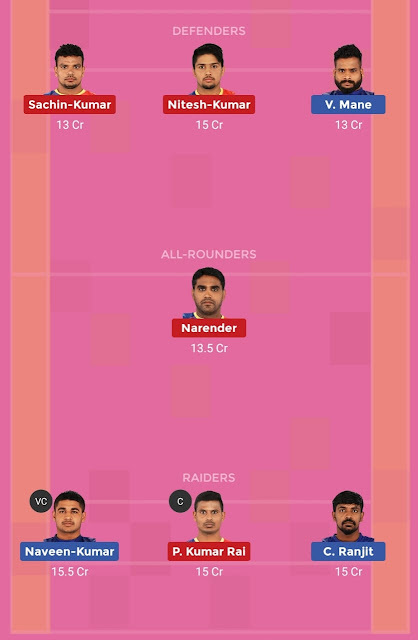 BLR vs GUJ Dream11 Probable7 Bengaluru Bulls Sunil Kumar, Mahender Rajput, Ruturaj Koravi, Sachin, Sachin Vittala, Rohit Gulia, Parvesh Bhainswal Gujarat Fortunegiants Pawan Kumar Sehrawat, Mahender Singh, Sandeep, Kashiling Adake, Ashish Sangwan, Mahesh Maruti/Raju Lal Chaudhary, Rohit Kumar BLR vs GUJ Dream11 FANTASY TEAM You can change C & VC between Raiders Section Sachin and KPrapanjan have done most of the raiding for the team of Gujarat Fortunegiants. You can pick from these raiders from the team. From Bengaluru Bulls, you can pick Rohit Kumar or Pawan Kumar Sehrawat for your team. Among all-rounders, you can pick Sunil Kumar or Ran Singh as they have maintained consistency. Among defenders, you can pick Amit Sheoran, Ruturaj Koravi and Raju Lal Chaudhary as these players are also capable of pitching in with a few points in every match. ADS vs SDT, 14th Match, Big Bash League 2018-19. 🏟 Where: Adelaide Oval, Adelaide. 📰 Team NEWS:🔖Adelaide Strikers: They have announced 13-player squad for the match. Peter Siddle and Liam O’Connor are added to the squad replacing Wes Agar and Harry Nielsen. 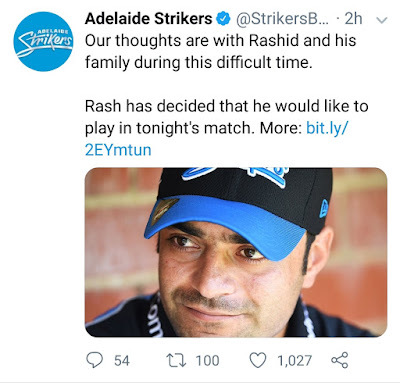 🖍️Rashid Khan’s father dies but he decide to play today's match. *Source:Twitter He decided to play today’s match. 🔖Sydney Thunder: SDT announced 13 men squad. Gurinder Sandhu can replace N McAndrew or Cook in the playing XI. 📰 TEAM NEWSCentral Stags: Doug Bracewell has been called up for the New Zealand international team for ODIs. He has been replaced by Dean Foxcroft, who was impressive in the recent Ford Trophy. The off-spinner/batsman will make his T20 debut. Wellington Firebirds: They have also announced the 13-man squad for the match. Peter Younghusband has been dropped while James Neesham not available for selection. they have added B Sears, Troy Johnson and Logan Van Beek in the squad. HB-W vs BH-W, 37th Match, Women’s Big Bash League 2018-19. 🏟 Where: Aurora Stadium, Launceston. Smriti Mandhana, Erin Fazackerley, Stefanie Daffara, Heather Knight, Corinne Hall, M Hinkley, Georgia Redmayne (wk), Sasha Moloney (C), Meg Phillips, Alex Hartley, Brooke Hepburn. BH-W: Beth Mooney (wk), Grace Harris, Sammy-Jo Johnson, Kirby Short (c), Jess Jonassen, Josephine Dooley/Sune Luus, Laura Harris, Delissa Kimmince, Laura Wolvaardt, Haidee Birkett, Jemma Barsby. 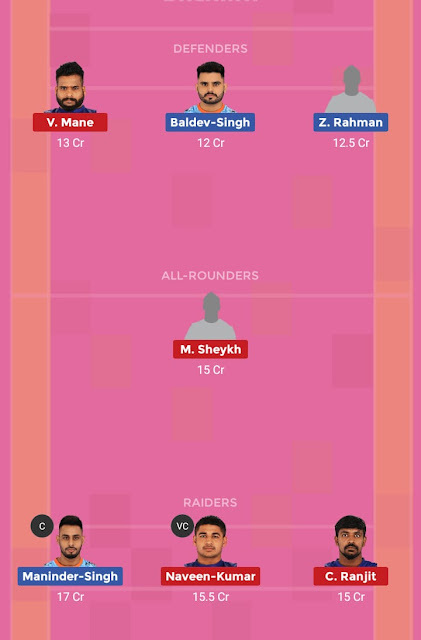 HB-W vs BH-W TEAM for #Dream11for H2H & Small League You can also pic C Hall in Place of S Daffara in Team 2. AS-W vs SS-W, 38th Match, Women’s Big Bash League 2018-19. 📰 AS-W vs SS-W Team NEWS Stay tune for NEWS.